The pseudonym for crosswords in the Financial Times set by Allan Scott, who also sets crosswords for The Daily Telegraph and The Times and has set the Everyman crossword in the Observer since 1994. Kate Fassett is a former crossword editor of The Daily Telegraph. She took over from Val Gilbert in 2006 and was succeeded by Phil McNeill early in 2009. The pseudonym for crosswords in The Guardian set by Mike Laws, between 1992 and 2000. Mike Laws also used this pseudonym for some crosswords in The Listener series. As Wiglaf, Alan Fearnehough sets cryptic crosswords in The Independent and advanced cryptics in the Enigmatic Variations and Inquisitor series. Chris Feetenby is the Puzzlemeister of The Mail on Sunday. He has also set puzzles for The Listener, using the pseudonym Corylus and he was previously (until 2008) one of the setters of the Mephisto crossword in the Sunday Times. Felix is the pseudonym used by Richard Rogan for Times Quick Cryptic crosswords. Fidelio was the pseudonym used by Tony Fontaine for crosswords in The Guardian. He started setting crosswords while he was serving a prison sentence. Albie Fiore, who died 28 July 2009, aged 63, set crosswords for the Financial Times (as Satori) and for The Guardian (as Taupi). In the 1970s Albie was the editor of Games & Puzzles magazine. He was also a contributor to the television show The Crystal Maze, a production designer for Games Workshop, an antiques dealer specialising in slot machines, an adviser in the development of Erno Rubik's puzzles, a writer of storylines for children's comic characters such as Scooby Doo, and a chef on private yachts. The pseudonym used by Geoff Oxley for Toughie crosswords in The Daily Telegraph. Flamande is the pseudonym used by David Crossland for Times Quick Cryptic crosswords. The pseudonym for crosswords in the Financial Times set by Anthony Plumb. Tony Fontaine was a former crossword setter for The Guardian, using the pseudonym Fidelio. Roddy Forman was educated at Eton and then, after National Service in submarines, at Trinity, Cambridge. He taught at Eton for forty years, and for the past ten years has been a part-time teacher at Summer Fields, Oxford. Using the pseudonym Radix, he is a setter of crosswords in The Listener series, the Enigmatic Variations series in the Sunday Telegraph, the Inquisitor series in The Independent, and puzzles for The Magpie. He is also one of the group of three setters - the other two being Steve Mann and John Guiver - who jointly set crosswords using the pseudonym of Mango. 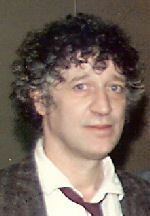 Mick Freeman was born in Buckingham in 1948. As Salamanca), he sets barred crosswords in The Listener and Enigmatic Variations series, and formerly in the New Statesman.